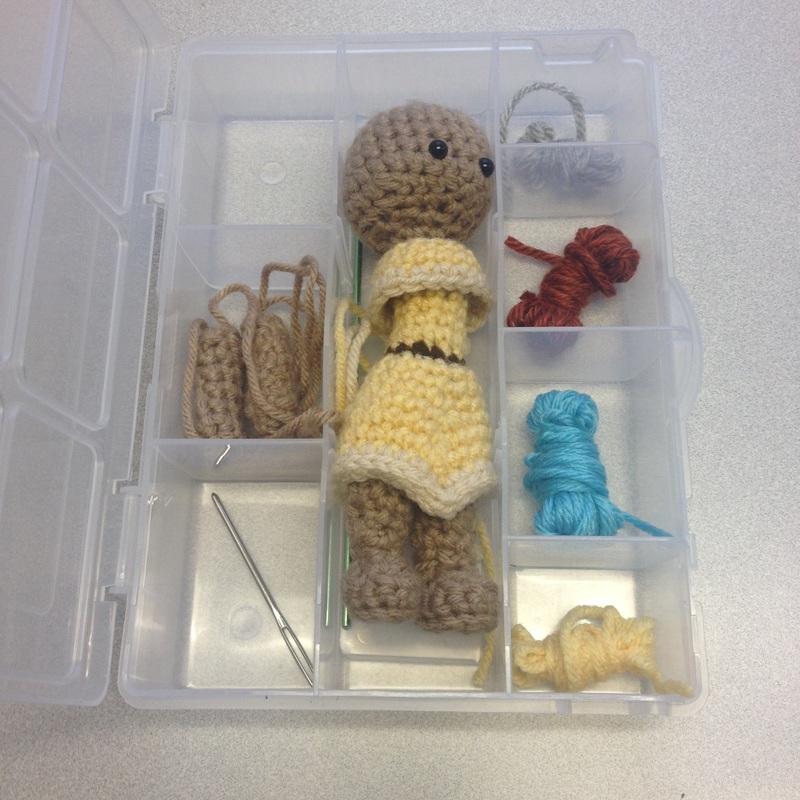 Tuesday Tip: Crochet on the Go! I am fortunate enough to have an hour lunch break each day, and while I don’t live far from work, I usually prefer to stay at my office and crochet over the entire lunch hour, rather than go home and spend 20 minutes of that hour driving. 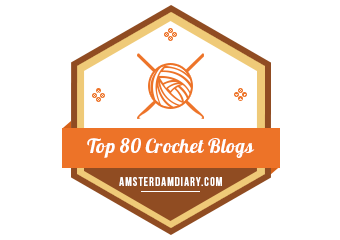 That’s valuable crochet time, after all! If you are like me, you probably put all of your crochet work into some form of tote bag and bring it with you each morning. But if you’re working with small amounts of yarn, buttons, safety eyes, needles, etc., you’re probably tired of putting them in a plastic bag and letting that float around in your tote bag. 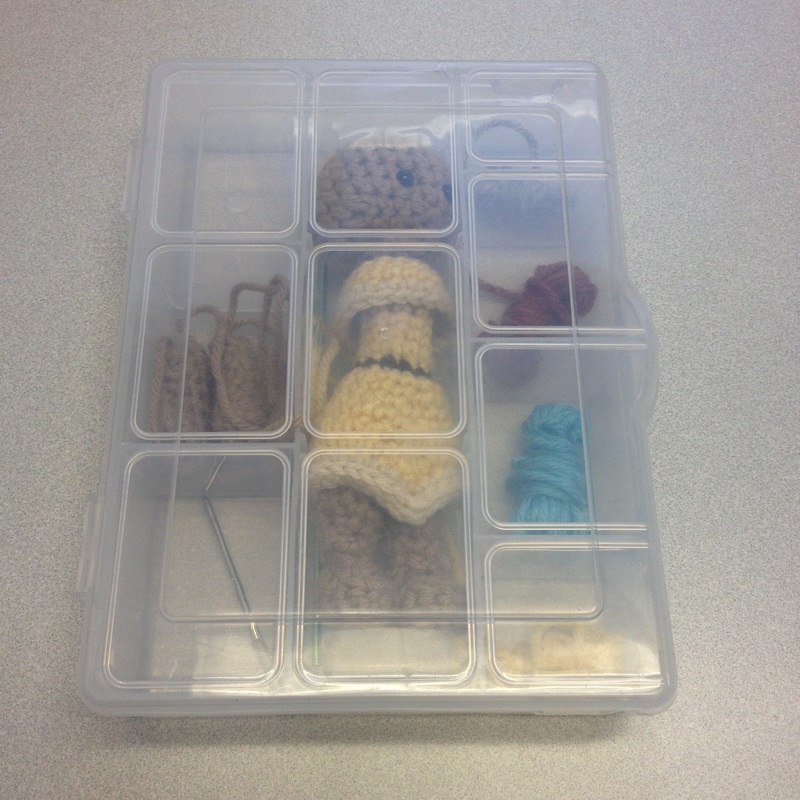 This Tuesday Tip has the perfect solution: a miniature tool parts storage container! These are usually used for spare drill bits, nuts, bolts, etc., but when I saw it on the shelf, I knew it would work wonderfully. I purchased mine from my local Ace Hardware store for about five dollars, and it’s just the right size for bringing along my princess work-in-progress. The one I purchased measures about eight inches long, six inches wide, and almost two inches deep. This container has eight compartments (three on the left, one large one in the center, and four smaller ones one the right), and it came with two extra divider pieces so that I can divide the middle section into three smaller sections if I wanted. The other divider pieces are fixed so that they won’t move, but the middle pieces can be removed at will. I especially love that the container is clear, which means you can tell at a glance what you’re low on and what you have plenty of. 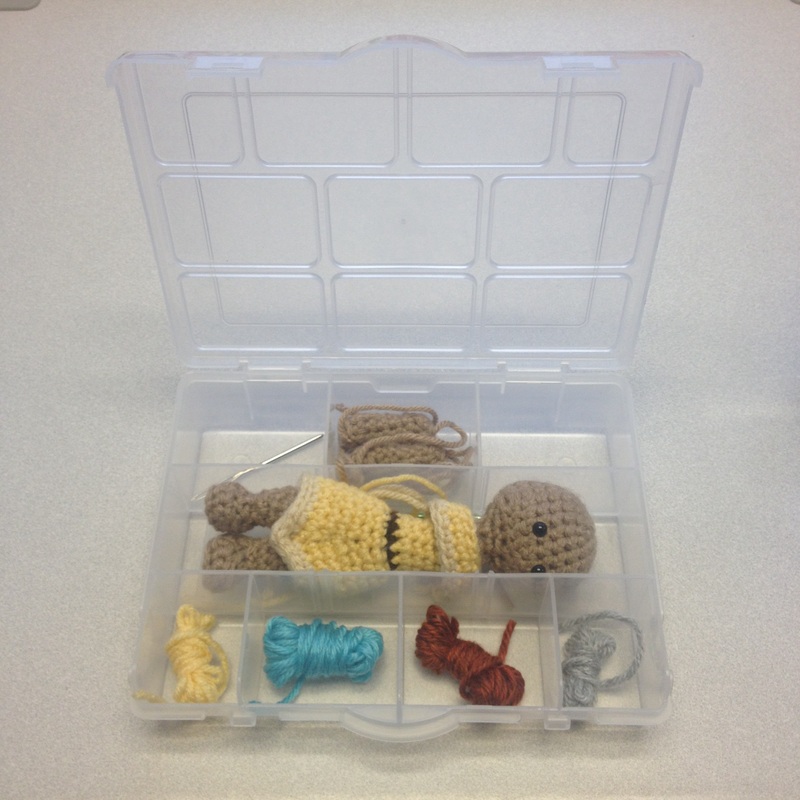 The smaller compartments are just the right size for spare doll parts (Pocahontas’ arms, for example), as well as small bundles of yarn, buttons, and safety eyes. You could probably put a fair bit of polyester stuffing in these compartments as well, though I usually just keep mine in a plastic bag–I can fit more that way. And the compartments on the left-hand side of the container are large enough for your tapestry needles to fit, too! The center compartment is just large enough for Pocahontas, though it won’t be when I get her hair sewn on. But it is just the right size for all of your crochet hooks, so you won’t need to worry about digging through your tote bag to find them anymore! The only problem with this storage container is that the lid doesn’t open all the way, but for only five bucks, I can deal with that. And if this size doesn’t work for you, there are others! I purchased the second-smallest size for travel convenience, but there were others on the shelf that were larger, had more compartments, movable dividers, and even had a real handle. So what are your on-the-go storage solutions? I’m always looking for new ideas! Tell me in the comments!